inquisitive creatures. Their almond eyes are candid, impenetrable, with a glow wavering in them. Their erect hood-shaped ears twitch lightly. One of the females is purring — lips, teeth and tongue are vibrating as her paws wallow. On her gingery coat a pup rolls and stumbles. She wrestles him with superb feline agility. In his hollow log, an older dingo coughs and sneezes, alarmed perhaps. Others are simply running and chasing each other in the reserve where king parrots fly in to feed on treats left hooked on trees. Under a eucalyptus, a pack of three dingoes plays with short snorting sounds. I can see their large canines. Their tune and behaviour suddenly change from robust play to a standstill. What made them stop, I wonder. Now they're stretching their necks and opening their mouths. Howling begins. A modulated succession of high and low-pitched notes. Is this some kind of signal? a visitor asks. The calls are quite recognisable. A yodel ... the same visitor muses. The dingoes can yodel, someone in the group repeats. At that moment the howling stops, and the dogs return to play. All go for a chase, circling around bushes and trees, climbing on rocks and over fallen trees, until reaching our group watching at the fence. That's where the maestro abruptly stops, comes near, stands on his hind legs and through the wire licks our hands. We say bravo to him. The other two linger there, watching on, too timid perhaps to make a move. Next to me, Anna the Austrian tourist springs up with an idea. She walks away some steps, takes a few deep breaths and starts to yodel. I take some photos of the dingoes and of her standing in the shade of the bottlebrush. All dogs and pups are silent. The yodeler-dog stops licking the stretched hands to stare at her. I watch his yellow eyes, his ears, his tail. He is still on his hind legs. I sense an interest, a decision in the making, should I try or should I not, he seems to debate. Suddenly he runs back to the rock, points his head towards Anna and joins her in his own canine style. His other companions hesitate, growl, shake themselves, then join in too. Visitors are gathering around the sanctuary. The keeper sits on a fallen gumtree, a dingo at his feet. As he pats him dreamily, he listens to the somewhat cacophonic notes coming from each side. His mind could be far away, in a different place, different setting, perhaps even in a different time zone. Some children start humming. The puppies seem excited and go back to test each other's strength. Mountains and wilderness ... (a whisper faintly heard nearby) ... what a wonderful mix! Lovely story. And you had me at the title! So we have these connections between different animal and people cultures - the iconic native Australian species, the aboriginal keeper, the Austrian tourist. That the dingo's voice could be heard as a yodel ties in with the theme that people, animals, and indeed all life, are part of this amazing blue planet. Beautiful animal. Like a cross between a greyhound and a fox. That's interesting, Tim. Thank you. Also thanks to Mathew, Gary, Eamon for their excellent comments. 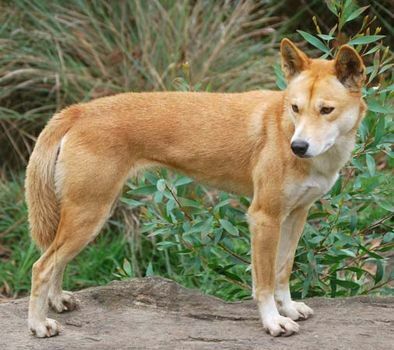 Yes, dingoes are beautiful creatures! Glad you liked it, Beate. Thanks. Always a song in our hearts. Lovely story! Lovely comment, Dianne. Thank you.